Florence is very proud and happy that, thanks to FINCA loans, she was able to send her children to better schools and then on to university. She was able to build a larger house for her family and also build a small house for her ailing mother in her home village. Uganda is a bright spot in Africa. 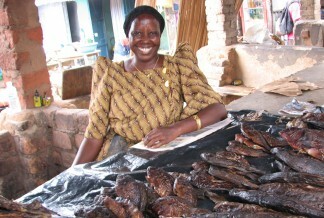 In the two decades since FINCA launched its Uganda program, the country’s poverty level has dropped by more than half. But while the economy continues to grow, unreliable electrical service, high energy costs, and an inadequate transportation infrastructure provide serious obstacles for low-income entrepreneurs seeking to build businesses and incomes. FINCA Uganda is the country’s first regulated, deposit-taking microfinance institution. It provides diverse products and services for low-income clients: Village Banking, individual, small group, home improvement and agricultural loans, youth products, seven savings products, insurance, money transfers services and even renewable energy loans. Hundreds of clients have benefited from FINCA’s solar energy loan product, which allows them to light existing businesses, ensuring longer hours of operations, as well as opening new businesses such as mobile phone charging stations. Use of the products in homes has greatly improved the health of families who no longer need to burn kerosene for light. 1Information is updated on an annual basis. 2Population lacking account at formal financial institution.